1. Crush the ginger nuts up so that they are crumbled and powdery in parts. 2. Cut up the rhubarb and put in a pan with the sugar and a splash of water. Cook till the rhubarb is soft and starts to break up. 3. Whip the cream until it firms up. 4. Assemble in bowls: first a bottom layer of crushed ginger nuts, then the cooked rhubarb, then the cream, and then a dusting of mixed spice. 5. Eat quickly before the cream melts into the rhubarb. The ice cream isn’t made, my grandma’s birthday cake is made, but needs re-making because I just found out that the prunes have stones in them – however this means we get the first cake, so let’s not cry too hard. 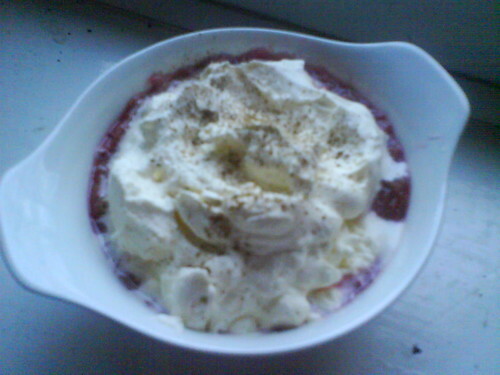 I was going to make the lemon merague from the book, but ran out of energy so whipped up the above pudding instead. 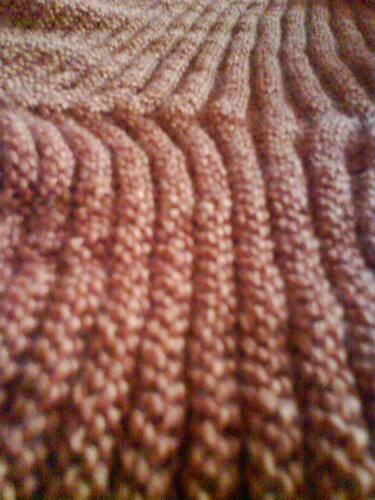 I spent two days knitting Angle in wonderful orange alpaca silk, (I know – orange yarn! Kind of a busman’s holiday. :), only to realise that I was definately going to run out of yarn, and that getting more was going to make the cardigan very expensive. The camera has gone awol in the post – the post office say they have delivered it, but don’t have a signature, which makes them think it is back at the depo. Unfortunately getting to the depo without a car and while pregnant, is a nightmare, so I have used the automated redelivery service to attempt to get them to find it and redeliver it without being able to stand over them and *make* them find it and redeliver it. Tomorrow we will see if that works or not. Long story short: I can’t take photos of the yarn accurately until I get the camera back, so it’s likely that the shop won’t get updated this week. Which is incredibly annoying all round.